The goal of a Diagnostic wax-up is to pre-determine the approach to the restoration. Once this has been determined, we do the wax-up by adding wax and or removing from the tooth structure (stone model). Reductions to the stone model will be marked in red, or a stent can be made to indicate the reductions made on the model. After the wax-up is completed, it will be duplicated and poured in stone to fabricate a stent which will be used to make the provisionals in the mouth. To read about this procedure in further detail please check out this news article. The goal of a Diagnostic wax-up is to pre-determine the approach to the restoration. Once this has been determined, we do the wax-up by adding wax and or removing from the tooth structure (stone model). Reductions to the stone model will be marked in red, or a stent can be made to indicate the reductions made on the model. Provisionals and a new Face bow registration is done. 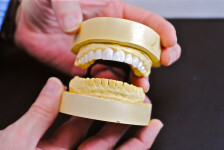 The new model of the provisional can be mounted in the Dental office, or the Face bow and the model can be sent to us. Pictures featuring Diagnostic Wax-ups are coming soon.